The UN Security Council on Tuesday condemned the recent ballistic missile launches conducted by the Democratic People's Republic of Korea (DPRK). 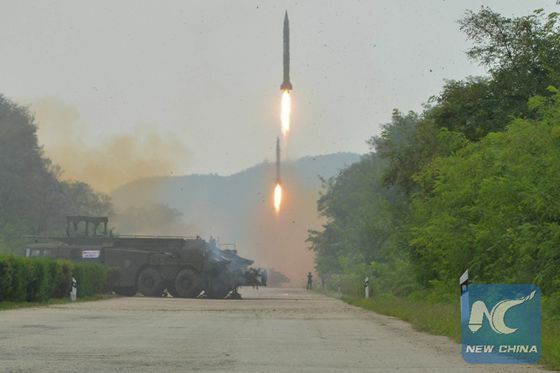 On Monday, DPRK fired three ballistic missiles into eastern waters. These launches are in grave violation of the DPRK's international obligations under relevant Security Council resolutions, said the 15-nation Council in a press statement. "The members of the Security Council deplore all Democratic People's Republic of Korea ballistic missile activities, including these launches, noting that such activities contribute to the Democratic People's Republic of Korea's development of nuclear weapons delivery systems and increase tension," it added. The missile launches came less than two weeks after Pyongyang test-fired a ballistic missile from a submarine off its east coastal town of Sinpo, where a submarine base is known to be located, on Aug. 24. The submarine-launched ballistic missile test was conducted in an apparent show of force toward the annual U.S.-South Korea military drills, codenamed Ulchi Freedom Guardian (UFG), which had run from Aug. 22 to Sept. 2. In the statement, the Security Council members also reiterated the importance of maintaining peace and stability on the Korean Peninsula and in North-East Asia at large and expressed their commitment to a peaceful, diplomatic and political solution to the situation. "The members of the Security Council stress the importance of working to reduce tensions in the Korean Peninsula and beyond," it said. "The members of the Security Council agreed that the Security Council would continue to closely monitor the situation and take further significant measures in line with the Council's previously expressed determination," it added.